Just because you file bankruptcy doesn't mean you're going to lose everything you own and end up destitute. That would run counter to everything bankruptcy stands for, especially it's guiding principle that everyone deserves a fresh start. When you file bankruptcy as an individual you're allowed to keep certain types of property, up to a certain value, so that you'll have what you need to get that fresh start. We call those exemptions or exempt property. The three most used types of bankruptcy protection, Chapter 7, Chapter 11 and Chapter 13, work in fundamentally different ways to eliminate or reorganize debt and allow the filer, also known as a debtor, a chance to get back on firm financial footing. One of those fundamental differences is the way each type of bankruptcy uses property exemptions, For a primer on how exemptions work in general, see Understanding Bankruptcy Exemptions. Chapter 7 cases are also called straight bankruptcy cases. In exchange for a discharge of debt, you'll agree to give up all of your property except for what you can exempt. A trustee appointed by the bankruptcy court is charged with the duty to take that property, liquidate it (turn it into cash) and distribute the cash to your creditors. If the debtor is a corporation, there are no exemptions. Instead, all of the debtor’s property is liquidated and used to benefit the creditors. Chapter 11 cases are reorganization cases. Instead of giving up your property, you're allowed to keep the property, continue operating a business (most Chapter 11 debtors are businesses, although some individuals file also, especially if they have a lot of debt or a lot of assets), while you negotiate new terms on your debt. Chapter 13 cases are also reorganization cases. In a Chapter 13 case, you (always an individual, never a corporation) also hold onto your property and instead you'll use future income to make payments over a period of three to five years. Those payments are used to pay down or pay off debt. These future payments take the place of the surrender of assets that might happen in a Chapter 7 straight bankruptcy case. 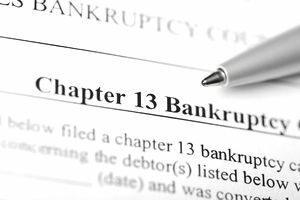 In fact, some debtors will choose to file a Chapter 13 case, even though they might qualify for a Chapter 7 straight bankruptcy, just so that they can protect assets they own that they might otherwise have to turn over to a Chapter 7 trustee to sell. Many times these assets will include property that the debtor believes will someday increase in value, like shares of a corporation or real estate. Instead of giving it up to a Chapter 7 trustee and eventually to the creditors, the debtor will choose to make payments over three to five years to pay down the debt. In both Chapter 11 and Chapter 13 cases, the debtor proposes a payment plan to adjust, pay down or pay off creditors. For a Chapter 11 or Chapter 13 case to be successful, the debtor must propose a payment plan that will leave his unsecured creditors better off than if he filed a Chapter 7 case. This is called the "Best Interest of Creditors" Test. Remember that unsecured creditors are creditors that have no collateral they could sell and apply to the debt if the debtor fails to pay. It includes general purpose credit cards, medical bills, personal loans and others. It even includes that $20 you haven’t paid back to Uncle Phil. Here’s an example of how the "Best Interest of Creditors" Test works, comparing a Chapter 7 and a Chapter 13 case. Don Debtor files a Chapter 7 case. After he applies all the exemptions to which he is entitled, he still has a coin collection worth $10,000 and an oil painting worth $5.000. The Chapter 7 trustee could take possession of the coin collection and the oil painting, sell them and use the proceeds (after the cost of the sale and his own commission) to pay part of the debt Don owes to unsecured creditors. Let’s say that the costs of sale and the trustee’s commission would total $3,000. That would leave $12,000 available to pay creditors. If Don wants to preserve the coin collection and the oil painting, presumably because they have sentimental value or because he believes that they will go up in monetary value in the future, he must propose a plan that will pay the unsecured creditors at least $12,000, the amount they would receive had he filed a Chapter 7 case. If he cannot show that his Chapter 13 plan will pay his creditors at least that much, the plan will not be approved. Even though debtors do not actually turn over their property in a Chapter 11 or a Chapter 13 case, exemptions are still just as important as as they are in a Chapter 7 case in valuing and distributing assets to creditors to satisfy debt.